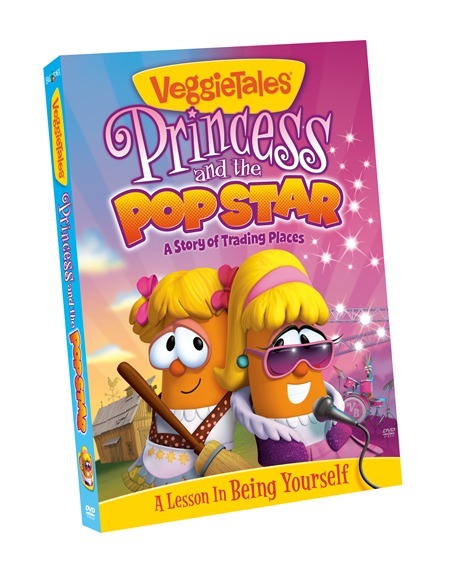 ONE OurKidsMom reader is going to win a copy of Princess and the Pop Star on DVD! *Visit Veggie Tales website and tell me something you like, learned or want. This giveaway ends at 11:59 PM EST on August 16, 2011. Disclosure of Material Connection: I received nothing in exchange for this post. I am disclosing this in accordance with the Federal Trade Commission’s 16 CFR, Part 255: “Guides Concerning the Use of Endorsements and Testimonials in Advertising.” The opinions expressed in this post are entirely my own. Your experience with the product may differ from mine. The sponsor is responsible for prize fulfillment and will be shipping the winner(s) their prize(s). For more information read my disclosure policy. I would love to have the Big Idea Entertainment Complete DVD Library for my family. I liked the fun create a room activity. Thanks! I liked Veggie tales on FB. Do you have coloring pages to print or desktop wallpaper for my computer? All of our VeggieTales and 3-2-1 Penguins! coloring pages and wallpaper — along with the rest of our interactive activities can be found through the Printables section of this site. Thanks so much for highlighting the VeggieTales website. I love the fact that the site is kid user-friendly and has activities to keep kids occupied and entertained. I love Veggie Tales. My girls love the movie Esther. We want the Indian Jones type movies from Veggie Tales or the new Larry Boy (besides wanting this movie). Thanks for the chance to enter. I am a facebook fan of Veggie Tales. I entered the Kindle giveaway. I subscribe to OurKidsMom by e-mail. My kids really want the DVD you are offering in your giveaway: Princess and the Pop Star : A Story of Trading Places. As I looked through the website, I would like to get one of their collections, such as the Royalty Collection Triple Feature DVD, for my niece who is 2. I “Like” OurKidsMom on Facebook. Jamie H.
I “Like” Veggie Tales on Facebook. Jamie H.
They have a CD called Veggi Tales Live Sing Yourself Silly. Entered the Scientific Explorer Outdoor Science Kits GIVEAWAY. I like the games there. Follow @ourkidsmom and @veggietales on Twitter and tweeted. I really like that veggie tales has based some of there dvds off the bible. I love these veggie tale dvd’s. i have neices i get them for. great stories. Initial entry: I Love that they have a Princess and the Pop Star event kit. That would be sooo fun!! Entry 1 subscribe to email. Entry 2 subscribe to email. I really like the activities. This looks very cute for the grandkids. I haven’t ever watch it but I would keep this at my house for when they came over. Looks like a fun thing to watch. I like the bob the tomato hat. I like the Creativity City VeggieTales PC Game. Thanks. I like that veggie tales are based on Bible stories. I follow on GFC as Tanaya_lynn. I entered for the Sunshine kids Carseat. I like veggie tales on Fb- Tanaya hunyadi Syx. I like the different activities on the web site. I learned they have some cool printables on their site. I like the updates they did on their site. It’s more colorful and animated now. The boys like to play the games on their web site, their favorite is Veggie Football! They Have interesting printables on Their site! I follow Our Kids Mom on GFC! Visited website, and I learned that Big Idea is headquartered in Franklin, TN. I entered Pur Minerals giveaway. I entered Scientific Explorer giveaway. I entered John Frieda giveaway. I entered Slatkin & Co giveaway. they have books online to tell stories. I like the Veggie Tales Live Sing Yourself Silly DVD. I didn’t know they had readable stories on line! I would love to get my girls some of the coloring and sticker book! I like the Bob Latch Hook Veggie Tales Pillow Kit. I love how many fun and interactive options they have on their website. My daughters are really getting into VeggieTales which is an awesome alternative to Sesame Street. Will be heading here first now instead of PBS kids! I like the fun look of the website. Great animation. Thanks Heather! like all the games there! I entered giveaway for Thomas & Friends Thomas in Charge! on DVD. I entered Marley & Me The Puppy Years DVD giveaway. I entered Hasbro Connect 4 Launchers Board Game giveaway. I entered Memorex Partycube Sound System giveaway. I entered Yo Gabba Gabba: Music Makes Me Move! DVD giveaway. I entered Nivea Prize Pack giveaway. I entered giveaway for Mobicam Digital DL Audio/Video Monitor. I entered giveaway for Fanboy & Chum Chum Brain Freeze DVD. I also like their VeggieTales Live! Sing Yourself Silly DVD. I visited the Veggie Tales website and learned that they have coloring sheets you can print for your kids. I learned there is a lot of interactive things on the site. Waiting for the little kids to wake up now! I think I would like the 2012 VeggieTales Calendar from the VeggieTales store. My kids would really enjoy it. The Bob Dress Up Costume would be cute to have too. We also like the Veggie Express Painted Wooden Train Set from Veggie Tales. I love all their DVD’s they have such wonderful messages for kids. I want Dave and the Giant Pickle. Like Veggie Tales on FB. I entered your Chicco giveaway. I’ve loved Veggie Tales ever since I was a kid and love seeing my kids love it, too. I like games on their website. I like how Larry the Cucumber talks on the website. I like the Veggie Tales e-cards. I follow Veggie Tales on Facebook under the username likwan. I shared this giveaway on Facebook at https://www.facebook.com/likwan/posts/195910220473359. I follow you and @veggietales on Twitter and tweeted about this giveaway at https://twitter.com/#!/likwan/status/103642363532029953. I learned that they sell party packs. I want the Lord of the Beans DVD!